Sashimi is a Japanese delicacy primarily consisting of very fresh raw seafood, sliced into thin pieces and served with only a dipping sauce (soy sauce with wasabi paste or other condiments such as grated fresh ginger, or ponzu), depending on the fish, and simple garnishes such as shiso (perilla, also known as Japanese basil) and shredded daikon radish. 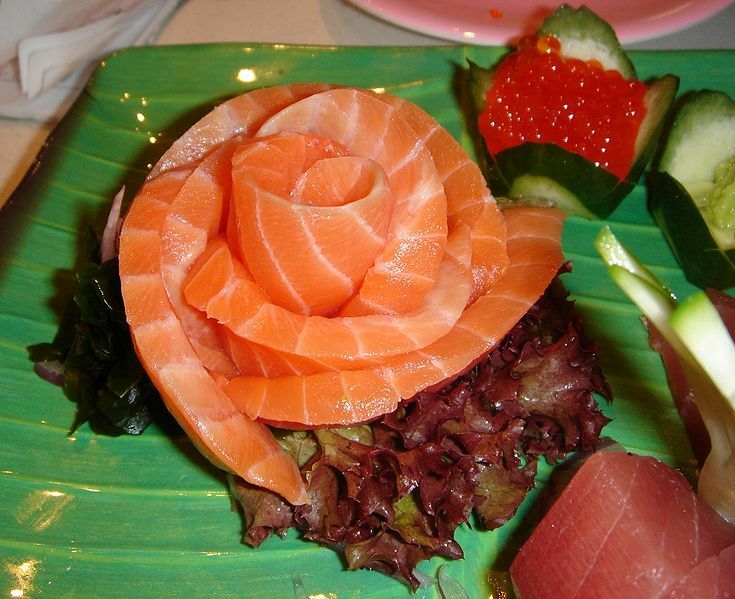 Left: A sashimi salmon rose. Dimensions of fish slices vary depending on the type of item and chef, but are typically about 2.5 cm (1") wide by 4 cm (1.5") long by 0.5 cm (0.2") thick. Many non-Japanese conflate sashimi and sushi; the two dishes are actually distinct and separate. Sushi refers to any dish made with vinegared rice, and while raw fish is one traditional sushi ingredient, many sushi dishes contain seafood that has been cooked, while others have no seafood at all. Some sashimi ingredients, such as octopus, are sometimes served cooked given its chewy nature. Most seafood, such as tuna, salmon, and squid, are served raw. 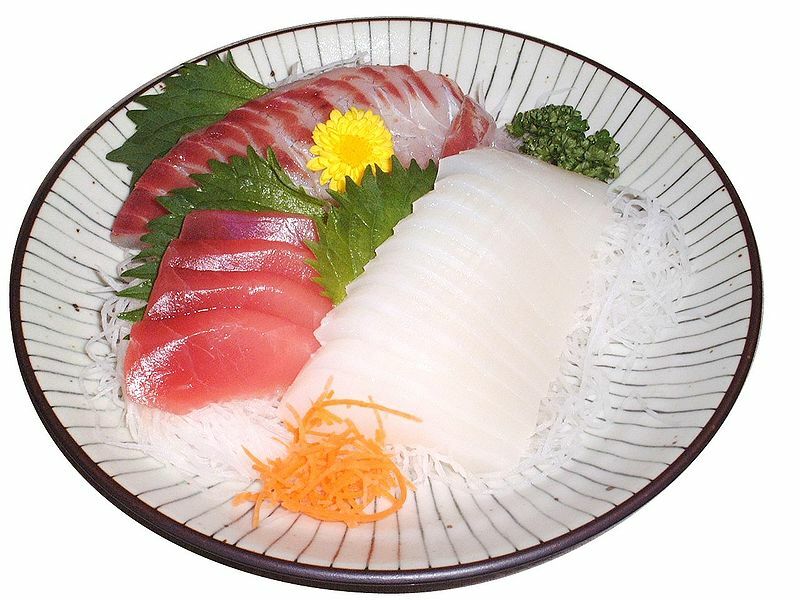 Sashimi often is the first course in a formal Japanese meal, but can also be the main course, presented with rice and Miso soup in separate bowls. Many Japanese people believe that sashimi, traditionally considered the finest dish in Japanese cuisine, should be eaten before other strong flavors affect the palate. Left: A sashimi dinner set. The sliced seafood that composes the main ingredient is typically draped over a garnish. The typical garnish is Asian white radish, daikon, shredded into long thin strands, accompanied by one green perilla leaf per slice. Wasabi paste is sometimes mixed directly into soy sauce as a dipping sauce, which is generally not done when eating sushi. Another way to flavor soy sauce with wasabi is to place the wasabi mound into the soy sauce dish and then pour it in. This allows the wasabi to infuse the soy sauce more subtly. A reputed motivation for serving wasabi with sashimi (and also gari, pickled ginger), besides its flavor, is killing harmful bacteria and parasites that could be present in raw seafood.